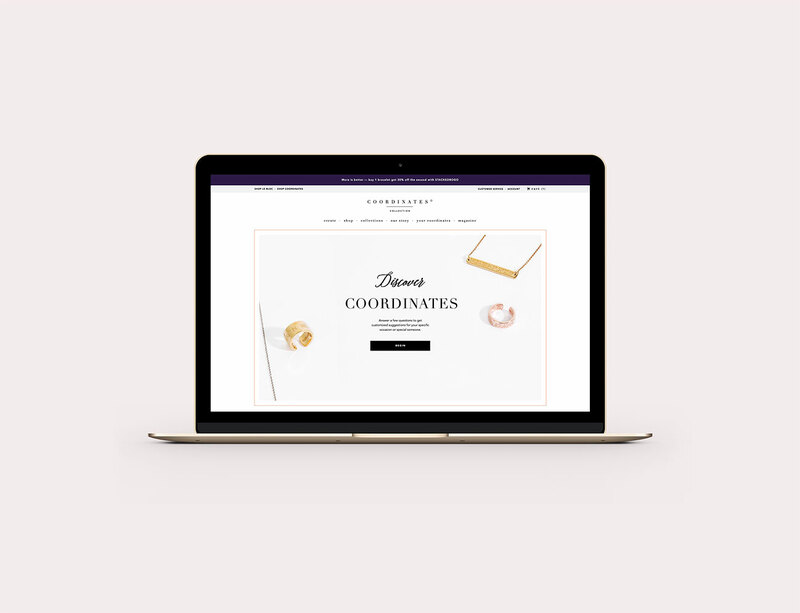 The Coordinates Collection website redesign required rethinking the visual and conceptual representation of the brand. The main challenge was communicating the customizable jewelry message. The solution was in simple photography and minimal typography, reflecting the elegance of each Coordinates piece. The jewelry is always front and center, easily showing the unique latitude and longitude numbers featured on each piece. 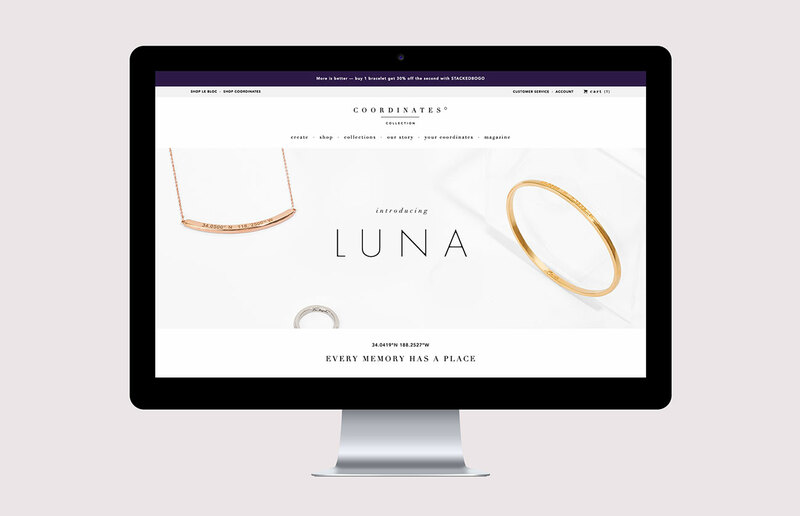 The end result is an elevated brand through an effortless, intuitive, and beautiful online experience. The homepage gives an introduction to the brand, featuring full width lifestyle images paired with individual products. It was important to also emphasize the coordinates concept. The solution was displaying latitude and longitude numbers combined with heartfelt quotes, which easily communicates the purpose of the jewelry. 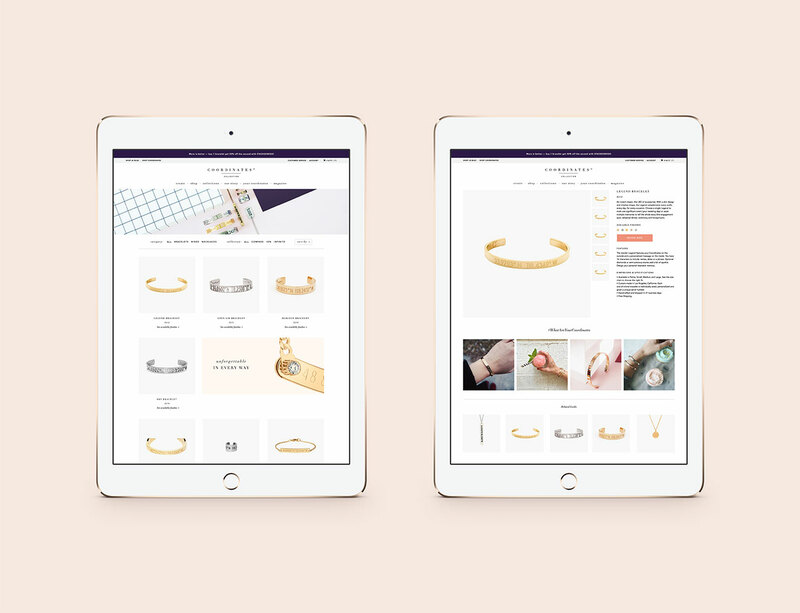 This new product page outlines the features and details of a new piece, highlighting the architecture of the jewelry and how it is customizable. Each new piece or line launched would get their own page, which added original content to the website as a whole, something that the previous iteration lacked. The process of designing a piece required many steps, including choosing the finish, material, coordinates, engraving, stone, and size of a given piece. It was important to keep the design and functionality easy to understand, follow, and complete. The steps are simple and seamless, keeping the customer engaged all the way through checkout. Discover Coordinates is an app-like feature which guides a user through several prompts in order to recommend products as a result. I developed and transformed a list of text into a design that uses playful photos to visually guide the user through the questions. 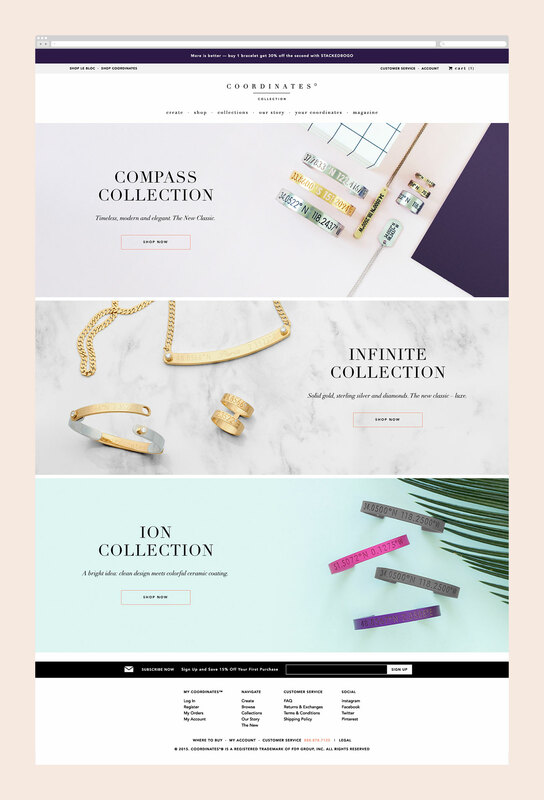 “The New” is the Coordinates blog, a place to update and outline new products and special features. The goal was to create a layout that was more than an endless scroll of images and text. My solution was to create various layout options that each post could utilize to stir up the visual monotony.